How much do we require of the people who entertain us and what does it take from them? How much do they pull from themselves and what are the costs? The news that Robin Williams died of an apparent suicide at the age of 63 Monday has come as a shock and a sadness, but not — and maybe this is the tragedy of it — a terrible surprise. Williams could make a live audience laugh so hard it was as if he were handing out comedy dopamine; the whole joint felt high, himself included. And yet the moment the laughter stopped, the pain behind his eyes was unmistakable. Williams had his demons; this we all knew. His great friendship with Jonathan Winters, a comedy pioneer of a previous generation whose career was both fueled and foiled by bipolar disorder, seemed an acknowledgement of the darkness both men courted to make us merry. Williams came clean on stage and in interviews about his cocaine addiction and abuse of alcohol, which he famously quit in the 1980s. He fell back into drinking after the 2004 death of his friend Christopher Reeve, joined AA, worked at staying sober. Earlier this summer he quietly entered rehab again. This is not proof of anything other than private struggle. But the struggle ran beneath his comedy like a bass note; it ennobled his better dramatic roles while sinking the worst ones with bathos. When Williams was truly on — in his live stand-up specials or on the TV show “Mork & Mindy” that brought him to fame in the 1970s or even as the voice of a Hispanic penguin in kiddie fare like the “Happy Feet” movies, he had a comic energy that could be frightening. Voices, impressions, observations erupted from him at top speed, and part of the thrill lay in sensing that the comedian himself was barely in control of his gift. Williams was the speed surfer of stand-up. Within nanoseconds, he could veer from musing on the problems of being Jesus Christ’s lesser-known brother Jerry to a riff on the 12 Apostles at a Chinese restaurant. He could sample John Wayne and Walter Brennan in a re-imagined scene from “Brokeback Mountain”; the bit is unprintable and unforgettable. He performed Bruce Springsteen’s “Fire” as if he were Elmer Fudd. Most of these bits were scripted; all of them zinged with the rude vigor of a man discovering them on the fly. No wonder Williams stepped so naturally into cartoon characters like the genie in Disney’s “Aladdin” (1992), possibly his single greatest comedy performance in a film. When he was being funny, he wasn’t quite of this earth. When he wasn’t being funny, you could feel the gravity pulling Williams down, and I think that’s the reason a lot of us feel — as we did with Philip Seymour Hoffman and others who seem to have worn their nerves in public, as a profession — that we’ve lost someone we knew. Well, we did know Robin Williams, it seems, because he was everywhere for a while. He drily joked in a 2010 interview about having been in eight movies in two years at one point in his career, acknowledging “this idea that you’d better keep working otherwise people will forget.” The insecurity that all our famous people possess and desperately try to hide, Williams put out there as the thing that drove him. 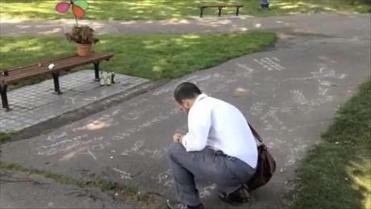 A memorial has started for Robin Williams at the Boston Public Garden. The dramatic movies, and the performances in them — some of them are quite beautiful, especially the early ones. Williams made an unexpectedly fine Garp — life-sized, befuddled, real — in his second feature film, 1982’s “The World According to Garp,” and his Russian immigrant saxophone player in Paul Mazursky’s “Moscow on the Hudson” (1984) is touched with grace and humor. “The Best of Times” (1986) is a very good movie no one remembers, about two middle-aged men (Kurt Russell’s the other one) replaying the high school football game that obsesses them; Williams makes his small-town loser so painfully, wonderfully awkward you cringe watching him walk into a room. Then came hits, deserved ones like “Good Morning, Vietnam” (1987), which allowed Williams to channel his motor-mouth rebellion into the role of an army DJ, and “Mrs. Doubtfire” (1993), which put him in drag for a family-friendly “Tootsie.” There were movies that catered to the actor’s maudlin streak, like “Toys” (1992), “Jack” (1996), and “Patch Adams” (1998), the latter loathed by critics and welcomed by those who don’t bother to read critics. Like so many gifted comedians, from Chaplin on down, Williams wouldn’t rest until everyone took him seriously. Yet that ambitious streak also led him into movies like Terry Gilliam’s “The Fisher King” (1991), probably his most extreme fusion of comic mania and serious acting, as well as the two teacher roles in which a lot of people loved him best. The first was “Dead Poets Society” (1989) where he’s a rebel Mr. Chips who leads his prep school boys to a greater engagement with literature and life. The second, of course, was 1997’s “Good Will Hunting,” in which Williams mangled a Boston accent (most of us forgave him), reenacted Carlton Fisk waving the ball fair in the 1975 World Series, and won an Oscar for helping Matt Damon’s title character discover his inner prodigy. In accepting the award, he thanked the people of South Boston: “You’re a can of corn, you’re the best.” Whatever that means, we’ll take it. In recent years, Williams started taking off-kilter character parts and riskier leads: The psycho Fotomat employee in “One Hour Photo” (2002), the grieving father of an accidental suicide in the pitch-black comedy “World’s Greatest Dad” (2010). The latter is not a movie that will give solace to anyone in the wake of Williams’s own passing, but it shows his daring increasing with the years. Speaking personally, I met the man only once, years ago and not in a journalistic setting, just in passing, the sort of random street encounter one gets used to in New York. I came out of my apartment for a morning run and started stretching my legs next to another jogger. It was a strange metamoment: We acknowledged each other with a good-morning smile, then I realized he was Robin Williams, then he realized I realized he was Robin Williams, and his face went dead, as though a steel gate had rolled down over his celebrity. I didn’t take it to heart; when you’re so famous that people stop you 100 times a day, this is how you handle it. Yet I also felt I’d glimpsed something of the blue-eyed bleakness that could leak through the actor’s performances, no matter the genre. The sense that his comic genius and dramatic angst were the tip of an iceberg of sizable psychic pain, one he negotiated on a daily basis, until, perhaps, he couldn’t. There is something horribly modern to be read in his death, even as we’ll probably never know (nor should we) what drove him to suicide. Robin Williams acted out the farce and the tragedy of the man who cannot stop being aware of himself. He may someday look like a Kafka hero stranded in Hollywood. I realized he was Robin Williams, then he realized I realized he was Robin Williams, and his face went dead.